I’ve been stubbornly resistant to making a pack basket. 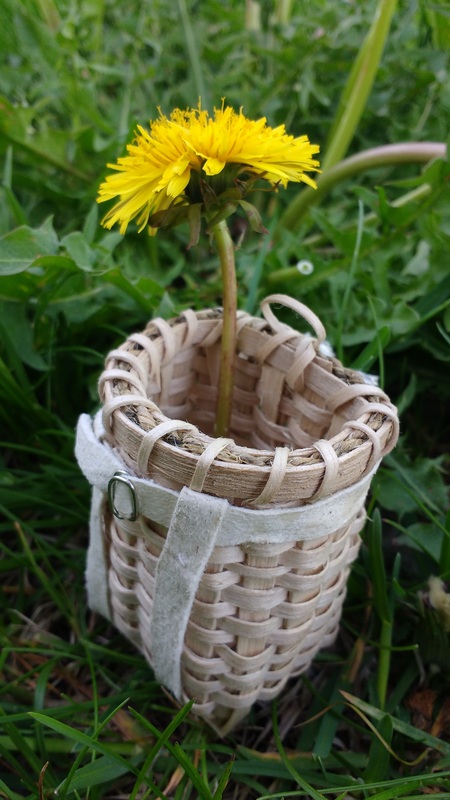 I have all of the brown ash splints, I’m weaving baskets, I have the intention of spending lots of time outside and often want to carry things with me, so why not a pack basket? I think exploring that question could very easily become a long essay stretching back into my early teens and getting into my reaction to visual cues that mark people as belonging to certain groups. I’m not going to write that essay right now. In brief, I’m kind of fond of my canvas rucksack. If I make and carry a pack basket primarily as a signal to other people that I’m the type of person who pounds ash trees and weaves pack baskets, that feels about as fun as having someone check what brand of jeans I’m wearing. I have several friends who legitimately love their pack baskets and use them all the time (and not just because they want to look cool!). But I’m not feeling the call to weave one for myself at present. That said, I started making a tiny basket for Grandfather Ray, who shared his basket-weaving skills with us back in February. It wasn’t supposed to be a pack basket, but that’s what came out of the ash. Once I realized I was making a tiny pack basket, I surrendered to it and embraced it, staying up late to painstakingly finish all of the details: the milkweed cordage rim; the adjustable buckskin straps. I consider this tiny basket to be the capstone, in some sense, of my Wildwood Path experience. Gratitude, seeking out elders, help from the community, plant knowledge, physical work, circling back to and deepening earlier skills. If you came here from Facebook, the answer to the mystery is that the basket is 2.25″ tall on tip toes!